Find out why the world's largest renewable-energy utility is a high-yield dividend stock you should avoid, despite its very attractive and growing yield. Source: Brookfield Renewable Energy Partners. 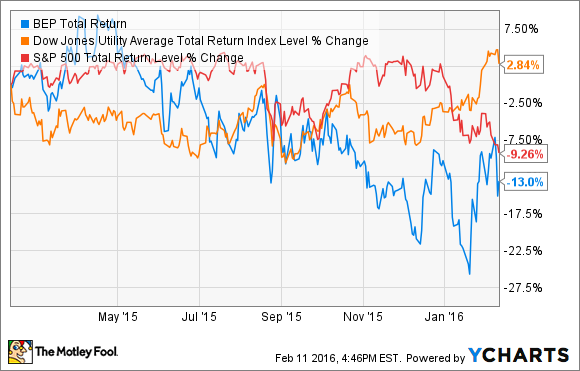 Defensive dividend stocks such as utilities have held up relatively well over the past year, as income investors flee to safety. One exception is Brookfield Renewable Energy Partners (NYSE: BEP), which just reported concerning earnings that illustrate why Wall Street is correct to offer a relatively high 6.5% yield for the stock. Let's look at three troubling trends that explain why I believe this high-yield yieldco is unlikely to make a good long-term income investment. Source: Q4 earnings supplemental information. At first glance, Brookfield Renewable Energy Partners' business model seems perfect. With the help of its sponsor and general partner, Brookfield Asset Management (NYSE: BAM), it's continually growing its hydroelectric and wind power capacity. Cash flow stability is provided by extremely long-term power purchase agreements with large utilities. With such stable, and theoretically growing, adjusted funds from operations (which is what funds the payout), management believes it can achieve 5% to 9% annual distribution growth. However, as you can see, 2015's sales, adjusted EBITDA, and, most importantly, AFFO per unit declined, despite an 8.4% increase in power generating capacity. Most alarmingly, its DCR, the best metric for measuring long-term payout sustainability -- declined substantially. When you look at the long-term financials of Brookfield Renewable Energy Partners, you see a pattern that calls into question whether or not management is truly following a strategy that is in the best interest of long-term investors. Source: Q4 earnings supplemental presentation. Thanks to the acquisitions secured via Brookfield Asset Management, the yieldco has been able to achieve impressive 8% annual generation capacity growth for four years. However, falling energy prices it's been able to obtain for its PPAs and worsening drought conditions affecting its hydroelectric dams, the cash available to cover its payout has been falling. In addition, over the past two years Brookfield Renewable Energy Partners has been increasing its reliance on equity funding via selling new units. While the 2.3% annual growth rate in its unit count is actually low for a yieldco (which funds growth via debt and equity markets as part of its business model) when combined with falling cash flow and a payout that's growing inappropriately fast, the long-term sustainability of the distribution comes into doubt. As you can see, 29% of Brookfield Energy Partners' contracts will end within the next five years. While management is confident that the long-term price of energy it generates will rise, there are none the less two key risks to its plans to grow its way back to distribution sustainability. First, to diversify its cash flow, the yieldco has been diversifying its power generation capacity away from hydroelectric dams and toward wind energy. From 2011 through 2015, its energy capacity mix has increased from 9% wind to 17%, courtesy of numerous European wind investments it's made with the help of Brookfield Asset Management. However, wind energy can also be highly variable, and in 2015 Brookfield Renewable Energy's actual wind power generation came in 9% below its long-term average. That was compared with 2014's 8.4% below average production. When combined with the yieldco's shortfall from hydroelectric production, Brookfield Renewable Energy's 2015 electric production came in 7.9% below expectations, more than double 2014's shortfall. This shows that the yieldco's electric generation is largely at the mercy of the weather, which is why I believe management's aggressive payout growth policy is inappropriate. Given the variability in its hydro and wind power generation, in addition to the long-term trend in falling contracting power prices, I have grave doubts about management's ability to continuing rewarding investors with 5% to 9% annual payout growth. Perhaps more troubling is that Brookfield Renewable Energy Partners, in a likely attempt to boost its unit price, continues to pursue an aggressive distribution growth policy despite a coverage ratio that continues to deteriorate. This short-term thinking could very well prove harmful to the yieldco's long-term growth prospects.